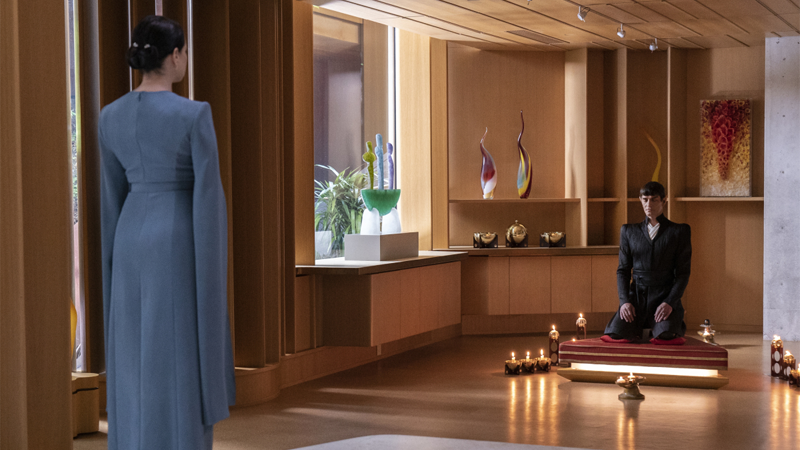 In a hard swerve from the first season, Star Trek: Discovery’s sophomore outing has been a lot happier to leave its overarching story with Spock simmering in the background as it focused on mostly standalone, classically Star Trek tales. It’s worked great so far, but this week's episode tried to have it both ways, and it never quite worked. The Discovery has a timey-wimey encounter with a temporal rift over Kaminar. Michael takes some personal leave back to Vulcan and is finally reunited with Spock. But that’s not even being particularly reductive, because “Light and Shadows” takes those two strands and tries to stretch them out over a run time that was simply too much. This is an episode of stage-setting – and the stage it’s setting is intriguingly bonkers – but it suffers from being pulled in the opposite directions of the more classically Star Trek-ian story of the Discovery’s time-rift-encounter, and taking the big arc focus on finally getting to see Michael and Spock together. Ultimately, neither storyline actually gets to do much than prep the audience for far more interesting stories to come. Tilly explains the virtues of putting the word “time” in front of anything you say to make it sound cool. 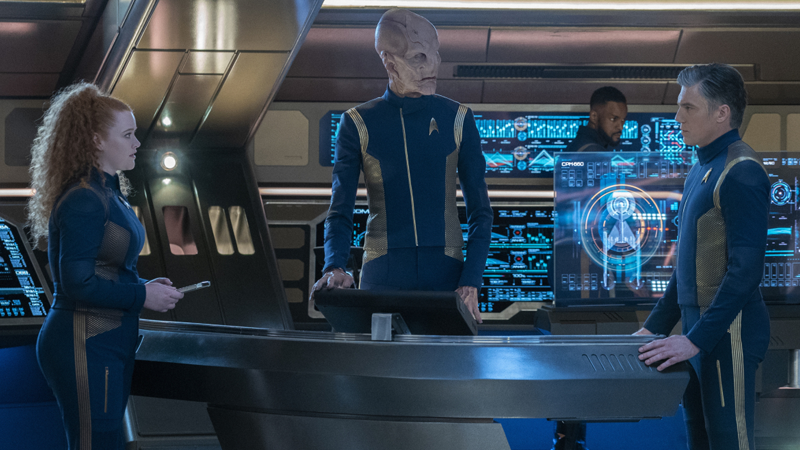 Let’s start with the Discovery side of things, where Pike and the crew find themselves suddenly having to deal with a ginormous temporal rift opening up practically moments after Michael takes her shore leave to Vulcan. Pike, reluctantly dragging Ash along, takes a shuttle to investigate the anomaly before it can warp time aboard the Discovery too much – leaving bizarre shadows of the past and future everywhere, like time-holograms – and promptly gets the two trapped inside the rift chasing a probe they’d sent to scan it. Because, really, would this be an episode of Star Trek if a shuttle wasn’t caught up in the weird anomaly it was investigating? Absolutely not. Anyway, things go sideways real fast in the rift – both in terms of the fact that the shuttle starts getting lost in different pockets of time, and also due to Pike and Ash just not getting along. It’s classic Star Trek – from Spock and McCoy, Tuvok and Neelix, to O’Brien and Bashir (at first), the franchise loves taking two characters who don’t get along, thrusting them into a tiny box (shuttlecraft or otherwise) and putting them through hell to make them ultimately come to a begrudging respect or friendship. Which is lovely, but because we’ve seen that kind of story time and time again in Star Trek, seeing it crop up here doesn’t really have a whole lot of impact, especially when it’s a story thread that is presented as a perfunctory distraction from the Spock stuff it’s woven around. 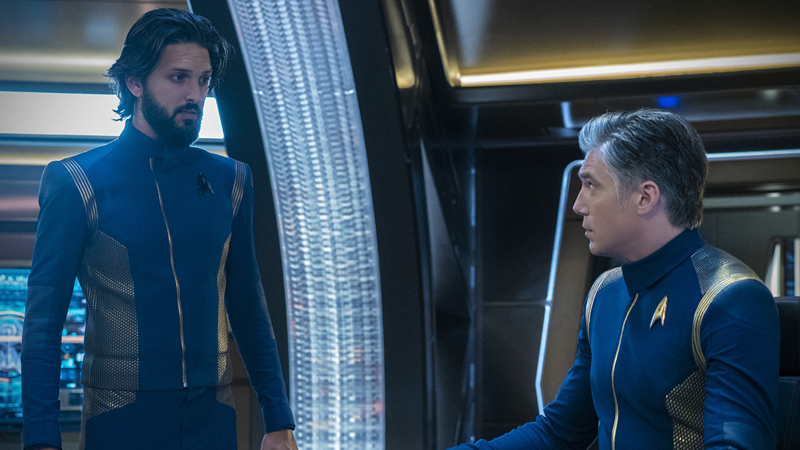 Given how it hastily resolves the time-rift dilemma just by having Stamets say “spore stuff will work!” and beaming over to rescue the duo with little in the way of challenge, it never feels like “Light and Shadows” is particularly interested in resolving Pike and Ash’s antagonism in an interesting way, leaving it to feel hollow. It doesn’t help then, that the Spock side of the episode is also frustratingly spinning its wheels whenever we take a break from the Discovery crew plot. Michael doesn’t so much reunite with Spock as she does just witness the broken man he’s become, hidden in a cave by Amanda as he mutters numbers and ancient Vulcan texts to himself. This might be the first time we actually get to see Ethan Peck’s Spock after episode upon episode of Spockteasing, but he’s less of a character and more of a mumbling plot device that Michael has to practically drag from place to place – namely Section 31, who are alarmingly easy to find for a secret organisation, in an attempt to surgically get answers out of Spock’s tattered mind – to try and keep the plot wheels slowly churning. A dogged Michael attempting to extract any kind of answer out of a frustratingly bullish Amanda pretty much symbolises the issue of this entire episode. So much of the emotional weight of seeing Michael finally come face to face with her brother again doesn’t land anywhere near as well as it should (despite some great moments from Sonequa Martin-Green once more – like breaking down and hugging her brother, even if he can’t tell she’s doing it, as she did with Saru a few episodes ago) because it’s left to be so-one sided from Michael’s perspective. There’s no real connection there yet, and after so much build up of tension percolating around this reunion, having it happen like this – where it might as well be that Michael and Spock have yet to actually interact – feels hollow. Nothing really gets to happen this episode in the way you’d want an hour of television to, well, you know, have things that happen. That is, until right at the end. Having realised (with help from Georgiou) that Section 31 would rather destroy Spock’s mind altogether than help him, Burnham escapes with her brother in tow, only to finally put together that the numbers he’s been muttering all episode long – in reverse order to account for a childhood aphasia re-awakened by Spock’s visions of the Red Angel – are coordinates to a planet. 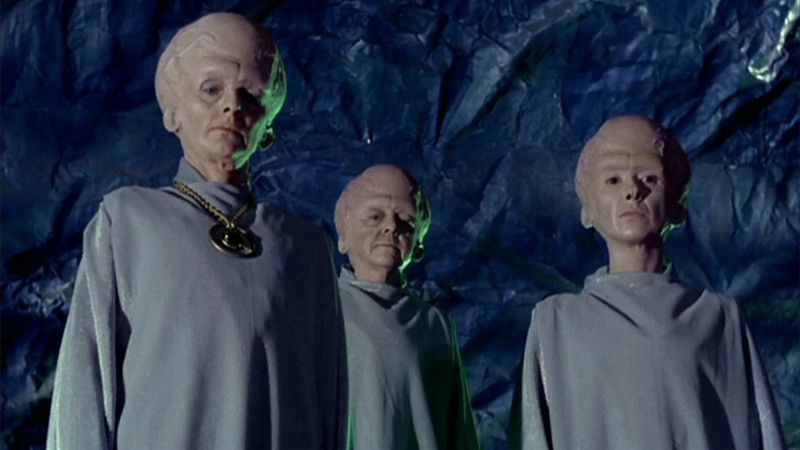 The giant-headed Talosians, as seen in the original Star Trek pilot. Given that the namedrop is where this episode ends, we have no idea what Michael and Spock will find on Talos IV – never mind the fact Discovery is actually set around three years after “The Cage” was meant to take place. But it’s less the place that is interesting and more the people who live there: the Talosians. “The Cage” and “The Menagerie” established the Talosians as a highly advanced culture that possessed vast psychic powers, addicted to using their abilities to create lifelike illusions. Could Spock’s visions be the Talosian’s psychic abilities projecting a divine-looking being into his mind? What if the Red Angel isn’t a time traveller but a Talosian attempting to save species and groups of people to bring them to Talos as prisoners they could base new illusions on, just as they’d wanted to do to Pike and his crew? What if it’s Pike and Spock specifically that it’s trying to lure back there with the signals? We’ll have to wait and see. It took long enough, but the age of Spockteasing on Discovery’s second season might finally be over. It’s just a shame we had to frustratingly idle on one more episode to really get a clue as to where the young Vulcan’s story is going next. As frustrating as Amanda is in this episode, it’s a total power move to have her glaring down Sarek during his mental search for Spock while knowing she’s keeping him hidden away in the caves beneath him. What a flex. I can’t believe I’m saying this, but hard disagreement with Tilly: Tsunami does sound way cooler for having the word “Time” in front of it. More lethal, maybe, but definitely cool. Last week, I was excited to see how the tension around Pike having to work with Section 31 would bubble over into a larger discussion about the idealistic morals of Starfleet at large...so I really hope that Pike and Ash being all “so we saved each other from a giant robo octopus probe from the future, we’re okay now” isn’t the immediate conclusion of that tension. 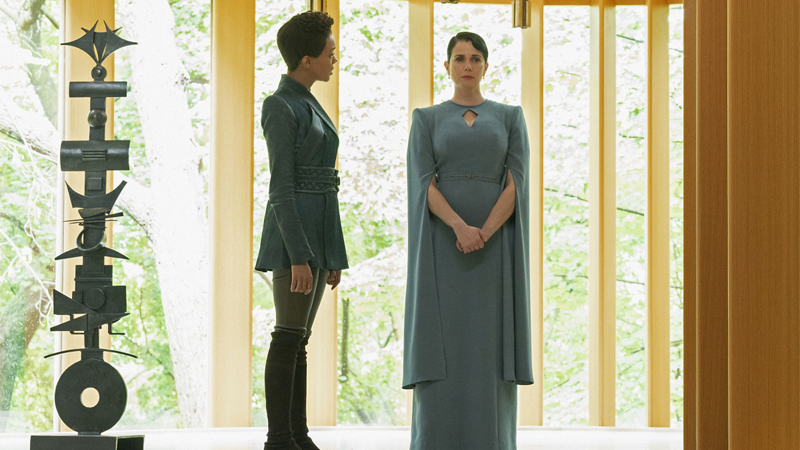 Speaking of Section 31, I assume Georgiou attempting to oust Leland from his position of authority is part of the set up for her own spinoff show, but I like the Game of Thrones-ian courtly intrigue vibe it has going for it. It’s very Mirror Universe of her and adds a more volatile element to Section 31. Airiam’s true nature has been a bit muddled so far – conflicting comments behind the scenes have pegged her as an augmented human, an augmented alien species, or even a synthetic hybrid. But she’s not purely android, so it’s going to be interesting to see how being infected by the future-probe’s techno virus impacts her. Some kind of evil cy...borg? Oh no. It’s not like Star Trek hasn’t tried to have its cake and eat it too when it comes to bringing the shadow of the Borg into prequels it absolutely should not be in, but I really hope that’s not what ends up happening to poor Airiam.